There are plenty of benefits of investing in dividend stocks, but there’s a common misconception that dividend stocks are too confusing, unpredictable and boring to warrant serious consideration for novice and conservative investors alike. However, research from the Financial Analysts Journal suggests that high dividend-paying stocks are less risky and return an average of 1.5% more per year than nondividend stocks. So why aren’t more people investing in dividend stocks? Sometimes, investors are more focused on the growth potential of a stock, rather than the monthly/quarterly/annual cash payouts they may receive in the form of dividends. One of the primary advantages of investing dividend stocks is the passive income opportunity. The average dividend yield on stocks ranges from 1-3% in many cases, and you typically receive these dividends on a quarterly basis throughout the year. When you invest in a diverse enough group of dividend stocks to receive payouts almost every month of the year, then you could be raking in dividend income with literally zero effort (beyond your initial decision to invest in companies that pay dividends). Dividend stocks are ideal for anyone who wants to supplement their monthly income, such as recent college graduates earning entry-level wages or retirees dependent upon Social Security or underfunded 401(k)s. There are plenty of success stories of people who achieved their financial goals with the help of dividend stocks, and it wouldn’t have been possible if they had relied solely on income from their jobs to get there. Investing in dividend stocks isn’t just about making more money to pay off debts or spend it on more vacations and day-to-day luxuries. 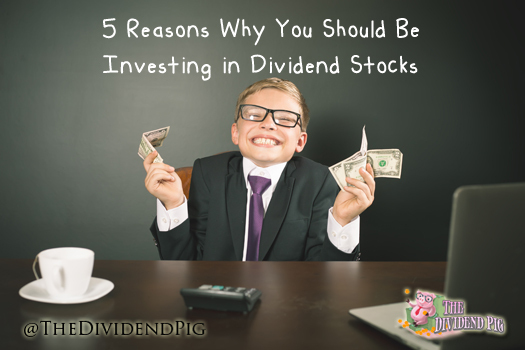 As the name suggests, dividend reinvestment plans (DRIPs) allow you to automatically divert your dividend payouts into additional shares of stock. These plans are incredibly advantageous because your wealth will continue to grow without much effort required from you. When it comes to taxes, it should be noted that DRIPs count as income. However, since your dividends are reinvested back into the stock with a DRIP, you don’t pay any capital gains taxes on that stock until you sell it. Whether you choose to go the DRIP route or opt for the cash payout, investing in dividends is an optimal strategy for people who are either on the verge of retiring or currently retired. On one hand, people in their 20s through 40s or 50s should strongly consider DRIPs as a way to maximize their retirement savings before finally quitting their day jobs. On the other hand, folks who are retired should consider investing in dividends as a way to extend the longevity of their retirement savings and provide consistent returns that supplement their retirement income from other sources like Social Security, rental income, pensions, IRAs, and 401(k) accounts. The dividend yield of a stock is an important consideration to make when it comes to deciding whether you should invest in dividend-paying stocks and deciding which stocks are the best fits for your portfolio. This leads to the concept of “yield support,” which is something that many people disregard until the market crashes. Think about it: if most stocks price are plummeting in value across the board, then why wouldn’t you and other smart investors jump at the opportunity to invest in something that offers some tangible value in the form of dividends payments? Solid dividend paying companies share prices are much more stable as their yield supports (provides a floor for) their share price. Stock price yield support is the reason why dividends are great for investors, even during times of high volatility in the markets: because consistency and stability matter more than growth potential during a market meltdown. A final benefit of investing in dividend stocks involves corporate accountability to shareholders. When a company does not pay dividends, then they have free rein to allocate the excess cash in any reasonable way they’d like, whether that involves managerial raises, expansion efforts, or even hoarding the cash altogether. When a company does pay dividends, then shareholders maintain a priority status for the board of directors for a company because they don’t want to risk shareholders fleeing the company in the event of a dividend cut. Additionally, this means the company must run a tighter financial ship to ensure it maintains enough cash to fulfill its obligations to shareholders on a monthly/quarterly/annual basis. Should You Be Investing in Dividend Stocks? YES! Whether you’re a 20-something who’s just getting started in investing or a 50-something on the verge of retiring soon, dividend stocks can vastly increase your investment yields on a long-term time frame in comparison to nondividend stocks. Of course you want to avoid putting all your eggs into one basket, but this is generally a safer way to secure higher returns on your stock investments, so don’t overlook the value of dividend stocks when you’re researching new ways to diversify and enhance your portfolio. Why not start now, begin researching and building your own dividend portfolio today. Being in my early 40’s with a goal to retire in my early 50’s, I won’t be able to build up enough to live entirely off of the dividends. However, I am targeting to reach a level that will be a nice supplement and allow us to take a more conservative withdrawal from our primary funds. In parallel, I am encouraging my two teenage sons to start now and include DGI as part of their strategy from the beginning. My oldest has started with VYM, while I am still looking for the right custodial account to open for my youngest (leaning towards M1 Finance once they offer it, which they’ve indicated is planned for this year). Good work with teaching your kids early-on! I wish I would have had that kind of guidance when I was a young adult. VYM is a great start. Schwab is also a good choice if you don’t feel like waiting… $4.95 a trade is a lot more than free, but they also have a large group of free to buy funds and ETF that are pretty good. I am doing my best to instill these lessons in them as early as possible, as I too wish that I would have had some guidance when I was younger. We may end up going with Schwab if M1 doesn’t offer it in the next couple of months. Right now he is saving up an “emergency” fund at Goldman Sachs earning 1.8% and he is saving for a computer. Once he reaches his goal on each of those, we will look to open an investment account for him. For the time being, I have given him access to an old Roth account I have to let him use the tools for research and planning out investments. My oldest isn’t nearly as interested, so I don’t force it on him but keep planting the seed. Very nice article Pig. I think you highlighted some nice benefits. The yield is an important discussion because I think there should be a focus on chasing safer yields, rather than juicy, high, unsustainable yields. You will see a 10% dividend get cut quickly. That’s why I focus on safe companies that have paid a dividend for a long period of time! Also, one other benefit here are the lower tax rates for income. The income stream you are creating is at a tax rate much lower than your regular wages! Yes, the lower taxes on dividend income are certainly a nice perk. I agree, about not chasing high yields. I made that mistake early on with SDRL – i’ll never do that again! Although I agree that there is some protection with dividend stocks when markets crash, that may not be the case going forward. That was true during 2008 when dividend stocks were more value priced. However, dividend stocks have had a good run and are more expensive than they have been in the past. Just go to morningstar and check out the portfolio report for some dividend ETFs. For a lot of the funds, the value metrics show them as more expensive. Now I am not suggesting DG stocks are not great investments for passive income. However, the statement that they will hold up during market crashes may not be true given they do appear to be more expensive now. What will be important is for investors to hold firm if they do drop substantially. Great blog and thanks for the opportunity to comment! I certainly understand your point. Perhaps I should have included a caveat addressing this sentence. While a great dividend stock will benefit from share price yield support, “the floor” is several levels down. Share price will fall across the board during a crash! For example, MMM, a dividend aristocrat that typically averages a yield of roughly 2.5% floored at almost a 5% yield in March of 2009. That is almost a 50% drop. While AT&T, another aristocrat, fell to a 7.5% yield – roughly a 34% drop. The dividend yield provides a tangible measure of value. One can invest X and expect to receive a Y yield. This is extremely valuable during a time when value is being sucked out of a market.